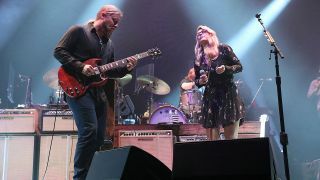 Tedeschi Trucks Band have revealed that they’ll play at London’s SSE Wembley Arena in 2020. The news comes after it was revealed that their upcoming shows at the city’s Palladium on April 26 and 27 had sold out, with the band previously selling out concerts at Indigo and the Royal Albert Hall. They’ll take to the stage at the SSE Wembley Arena on February 1, 2020 – their only European show next year. Tickets will go on sale from 10am on Friday (April 12). Tedeschi Trucks Band have lined up the special performance in support of their latest album Signs, which was released in February via Snakefarm Records. The album was written and recorded amid a series of sad losses for the band, including the death of Derek’s uncle and Allman Brothers member Butch Trucks, Gregg Allman, along with mentors Leon Russell and Col. Bruce Hampton. Susan Tedeschi added: “We are very lucky to do what we do, and we take responsibility for creating something positive to counter all the negativity. In February, Kofi Burbridge, who played flute and keyboards in the band, died at the age of 57.